Is it weird that Christmas was three months ago? The days are feeling longer, the clocks are going to go forward on Sunday and it’s almost the Easter Bank Holiday weekend and my dad’s birthday! First and foremost we have to get Easter out the way, and that means eating Easter Eggs! I love chocolate. And Easter is the one time when it seems acceptable to eat loads and loads and loads. Not that I’m complaining. 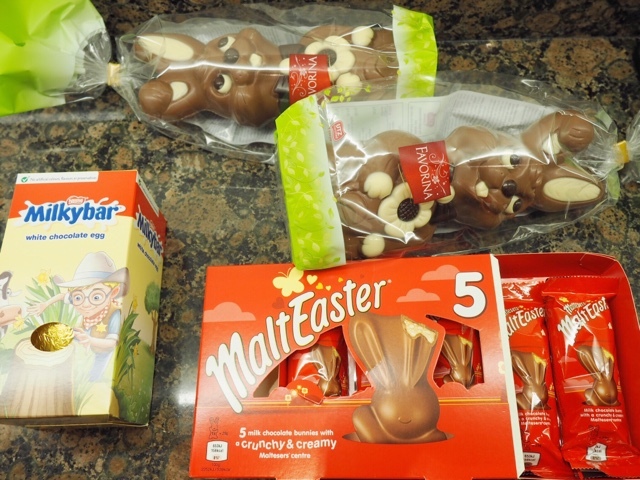 My mum and I gave up chocolate for Lent this year and we know that when we eat it we’re not going to be able to eat a lot in one go, so this year we’ve my dad has bought us Easter bunnies, I’ve stocked up on Malteser ones (£2 in the Co-op – bargain!) and bought myself a little Milky Bar egg because I love white chocolate. Seeing as none of have to go to work for four days, the plan is to stay up late and watch an insane amount of films with the surround sound on. Because this is the only way to actually watch films. It’s like being in the cinema but from the comfort of your own sofa so you can just pause the film to run to the toilet instead of having to wait for a part you think you don’t mind missing. I love watching Batman so we watched The Dark Knight the other day and the surround sound was just amazing. My dad hates having people fuss over him but that doesn’t mean we don’t do it anyway, and because we have a big family my mum uses any excuse and occasion to try and throw a party. Easter is the perfect time to bring everyone together and my dad’s birthday is the perfect reason. So what do we need for the perfect party (other than people of course)? Cake. I come from a Jamaican and Guyanese family so everybody loves fruit cake, but my dad is also partial to an amazing Victoria sponge, lemon or chocolate cake, so a trip to Konditor and Cook was definitely on the cards when it came to getting something for him. Music. As long as it’s good music, I can hear it and the sound quality is amazing anyone is welcome to be the DJ. Panasonic Wireless Speakers come in handy at this point. Not only are they bluetooth, which means no messy fingers have to touch it, but it also be connected to multiple devices, so if one person’s music is just not doing it, another can jump in. Photos. My Fuji Instax Mini Print 8 is on standby, topped up with film for little photos for everyone (mainly myself but I guess people can also take some away), and my Olympus Pen E-PL7 will get all the moments in between. Good weather. It hasn’t been too bad lately if it holds out of the weekend that would be awesome and probably reason to have a BBQ. Last year our garden was an absolute mess from all the building work that was going on with our extension and kitchen that we couldn’t enjoy the little bursts of summer that we had. 2016, don’t let us down. Drink. Just like the situation with the fruit cake, my family are some brandy and Jamaican rum drinkers. But of course we are sensible. "Books to read in 2016"
"58 Artisan Wellbeing Room Mist"